I’m dedicating this post to a fan of our work named Justin Joe, a young photographer who I (technically) met for the first time yesterday while I was in my old neighborhood visiting family. He recognized me and called out to me by name, all because he follows our blog and knew our photography from the web. Justin, when you get that new camera and speedlight, this is the first thing I want you to try. 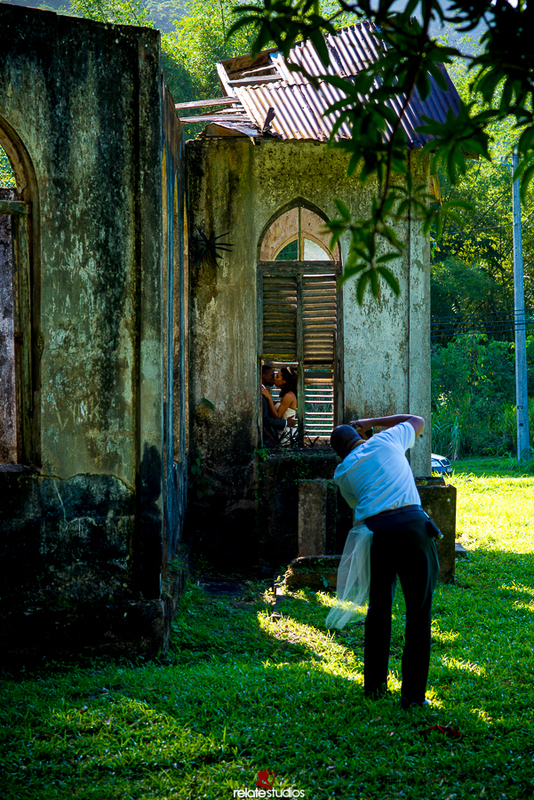 Hundreds of wedding photographers have shot almost every conceivable wedding portrait at St Chad’s Church, better known as “De old church in Chaguaramas by de golf course“. Those hundreds include us. Shooting Justin and Krystle’s wedding portraits at the same spot, presented us with a challenge; do something original, or at least something not very ordinary. When we got there, I felt we needed to go BIG and show almost the whole building and some of the surroundings. 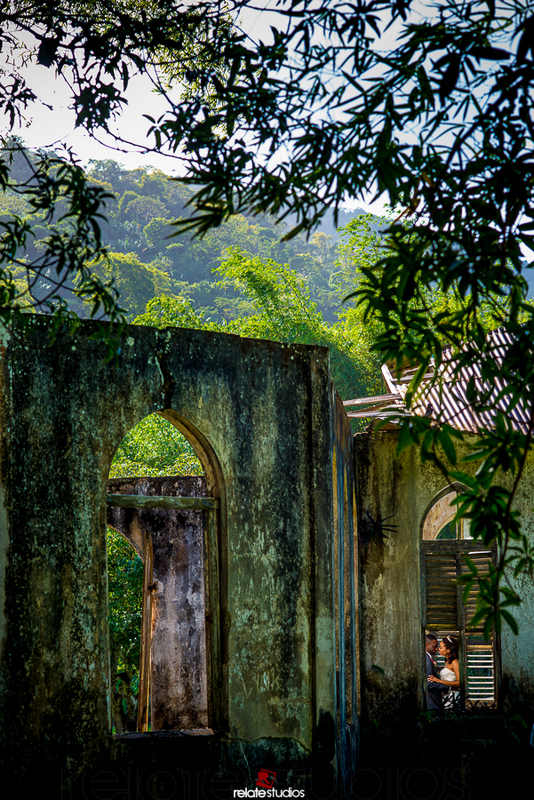 In the past, many shots only focused on the windows of the church and rightfully so, because the windows are excellent frames for your subjects. Also many shots focused on the aged and weathered feel of the building, which usually is a nice contrast against well tailored suits and shiny, stylish wedding dresses. We decided to use these two elements and then take things a bit further. We usually make use of speed lights to light our couples, when they would otherwise be photographed as silhouettes. 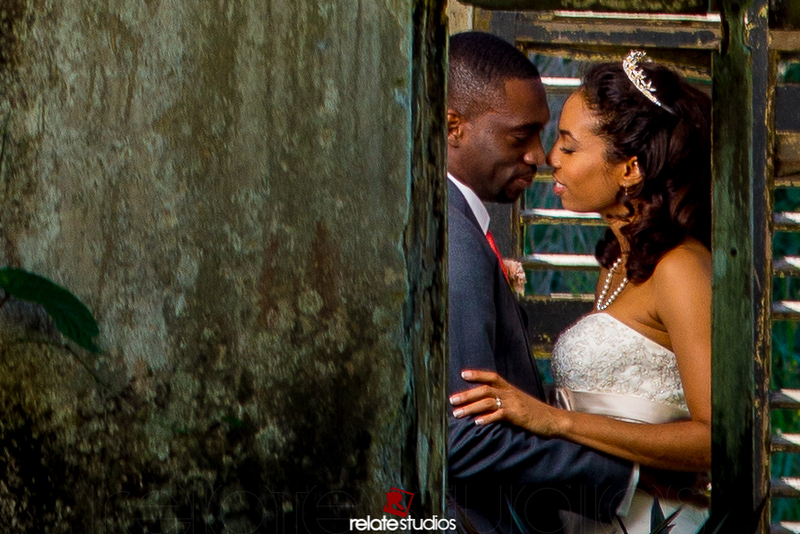 In this case, Ayinde had the idea of bouncing the light off the inner wall of building instead of using a bear bulb flash or a shoot through umbrella to expose the couple. Using this technique not only turned our small lights into “big lights”, utilising the entire height of wall as a light modifier but it also gave the photograph a warm tone because of the yellows and creams of the aged wall, almost like a CTO gel, without the hassle of taping one on. Two flashes were used, each placed camera left, around 4 feet off the ground and set at half power. We opted to use two flashes at half power, as opposed to one flash at full power, for faster recycle and to allow us better control of the light by being able to set the direction of each flash head independently. Each flash faced the corner, with the two heads slightly divergent so the light would hit the walls about a six inches away from where the walls met at a 90 degree angle. Ayinde placing the first flash…or rather AFTER he placed the first flash. Outside of building, where the exterior walls were in the shadows, the colours were much darker and colder, with hues of blue and a mix of browns and deep greens. you could still see the light of the sun through the windows, illuminating the greenery on the hills opposite, which provided excellent image contrast. We wanted to get the building dark enough to be interesting but not totally black, so we focused on balancing the foreground, as opposed to trying to correctly expose the background which could have easily ended up overexposed. Ayinde taking the shot after it was set up, you can see how dark the room is without the flash. 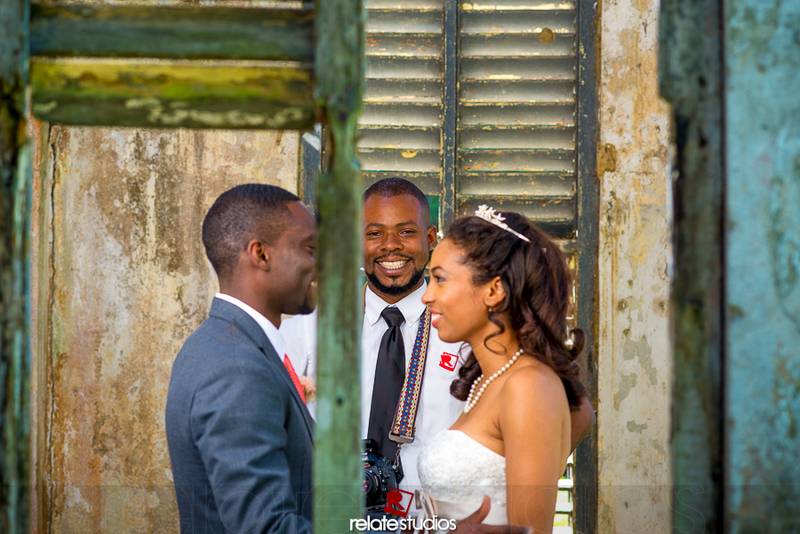 Please note the Bride’s veil in his back pocket. Everything was done simultaneously. 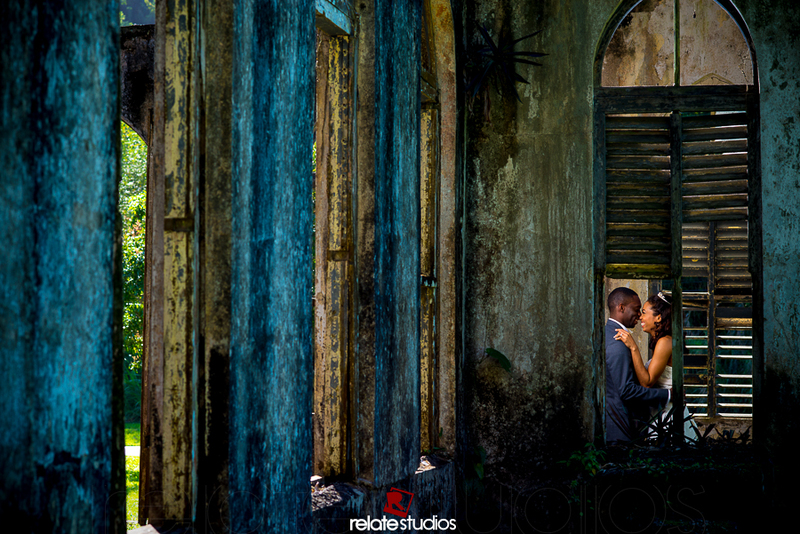 I got Justin and Krystle inside and standing in the frame of the window, Ayinde placed the first light, I took a few frames, then I positioned the second light and Ayinde started shooting. Once we got the exposure correct, we both shot with our own cameras in tandem. We shot a few close up frames, but then we stepped back and went BIG, lighting the room while shooting Justin & Krystle through the window. The rest of the building in the foreground was kept dark and the far background balanced so it could retain sufficient details. It took about 3 minutes, from the time Justin and Krystle were positioned, to get all the shots we wanted. The final exposure after the flashes were added. 100% (ACTUAL SIZE) crop of the image above. You can see the detail maintained with the use of the flash. 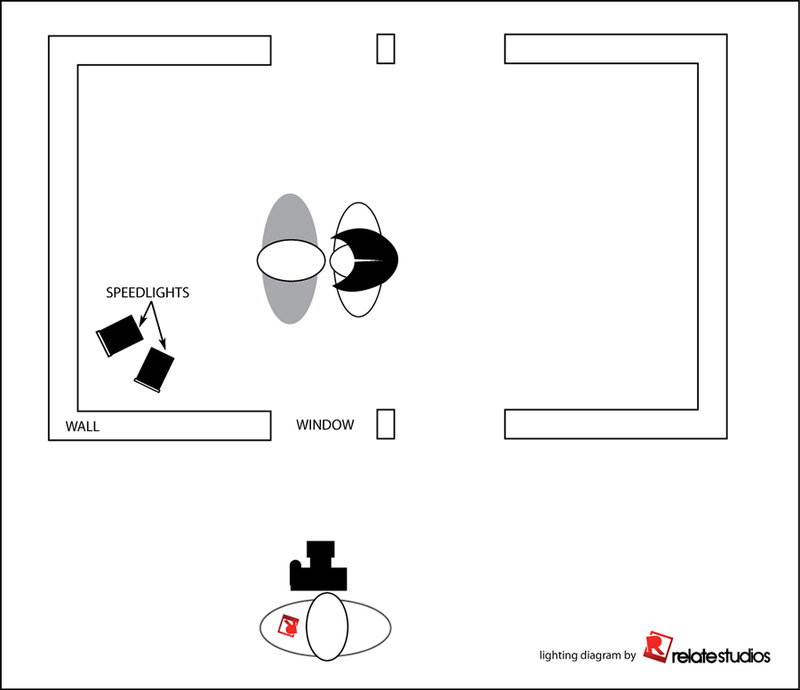 We were going to use SYLIGHTS for this lighting diagram but they didn’t have the walls we wanted, big up to them anyway.